Beard Oil - Sandalwood, 1 fl oz (Every Man Jack) - Penn Herb Co. Ltd.
Our blend of naturally derived oils condition and soften your beard while hydrating and soothing sensitive skin. Essential oils of sandalwood refresh. Our products give you exceptional performance using only naturally derived ingredients. No parabens, no phthalates, no dyes, no sodium lauryl sulfate, and never tested on animals. Carthamus Tinctorius (Safflower) Seed Oil, Olea Europaea (Olive) Oil, Tocopherols, Linum Usitatissimum (Linseed) Seed Oil, Borago Officinalis (Borage) Seed Oil, Argania Spinsosa (Argan) Oil, Butyrospermum Parkii (Shea Butter), Fragrance/Parfum. 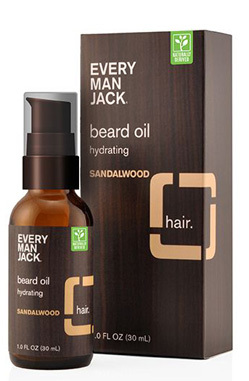 Conditions & softens beard, while soothes sensitive skin. Rub a small amount n your palm. Gently work into beard and onto skin.